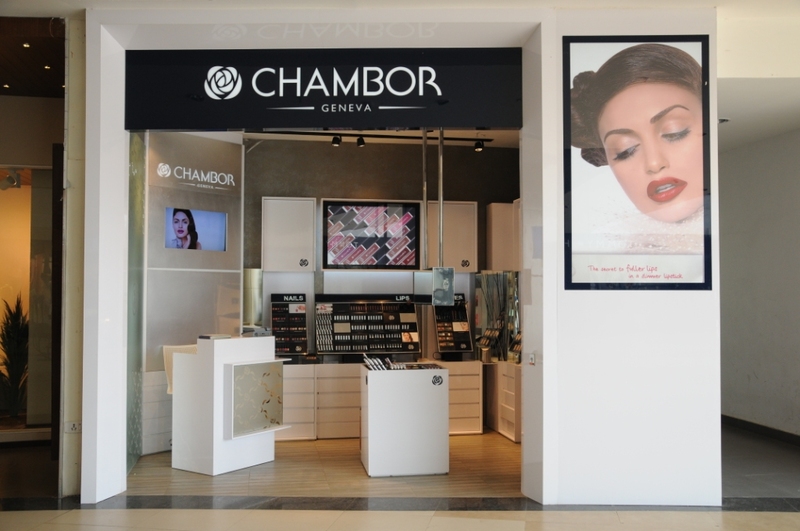 Leading make up brand Chambor Geneva has taken the city of Bangalore by storm with the launch of its first exclusive store at Phoenix Market City Mall. 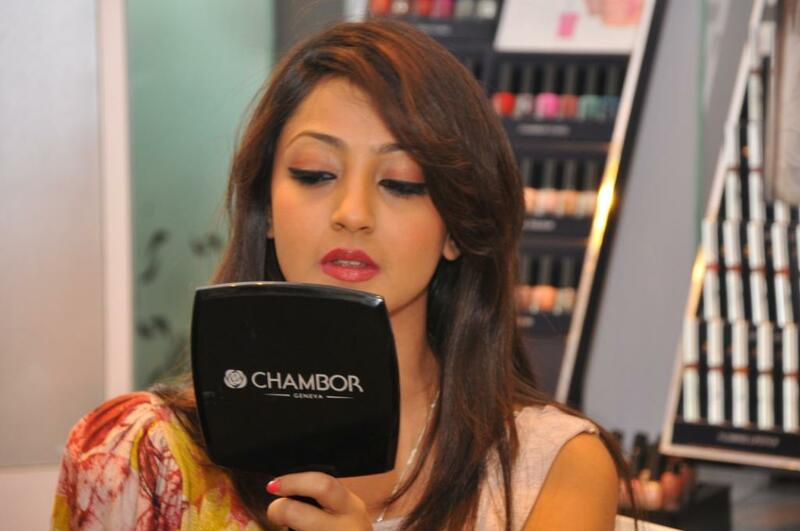 Fashionista and acclaimed Kannada Actress Aindrita Ray inaugurated the store and got a stunning makeover by Chambor’s team of make-up artists. While Chambor cosmetics are available to customer at all leading departmental stores with over 380 counters across India, the launch of this exclusive boutique is said to be the perfect way for consumers to discover and experience, first hand, the brand’s range of colour cosmetics, skincare and expert advice. When in the store, customers get a walkthrough of Chambors vast range of products such as foundations, concealers, eye makeup, lip and nail colour,etc,exchange tips and ideas with the makeup artists and also get professional advice on how to choose the right product to suit their skin type. And that’s not all! The store is also an academy in itself.Teaching is a key component of Chambors philosophy. 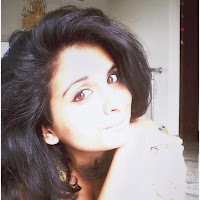 Women can walk into the store for personalized lessons and makeup tutorials on Eye makeup techniques, Face makeup techniques, Evening makeup session, Bridal makeup sessions and many more other techniques and tutorials. Before applying any make-up, each artist takes into account a woman’s personal style, lifestyle and preferences. The boutiques’modern and hygienic aesthetic is reflected in architectural details such as plush interiors, suave flooring and beautiful lighting, whichaims to evoke the ambience of a chic Soho loft. A lot of tables have been provided which creates a warm and welcoming environment for the consumer and friends to trial products at their leisure or enjoy on-the-spot make-up lessons from Make-up Artists.This boutique provides its customers with a larger than life shopping experience, which will indeed be a memorable one! 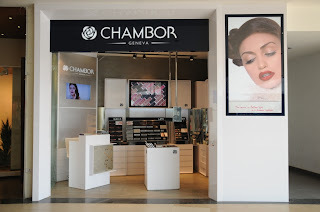 Carried by expert legacy, Chambor is a pioneering beauty house, where the line of color cosmetics & skin care range of products comes to you from rich background of technology and fashion based in Geneva, Switzerland. Chambor’s beauty secrets, created with the finest of formulations are developed with a precise understanding of the feminine face. Since 1993, Chambor- Geneva in India has established a foothold in the world of cosmetics as a renowned classic beauty brand. Chambor believes in giving more & more to the customer may it be service, innovative products, skin care, personal attention, affordable products, etc. A gloss that combines color and treatment, Chambor Glitzy Gloss is as soft as a cream and rich as nectar. Now with a special additive- Jojoba Oil, one of the finest cosmetic ingredients with anti-aging and skin conditioning properties, indulge your lips with extra care and comfort. Available in a trendy bottle, with a doe foot applicator for quick, smooth and even application, the stylish new Glitzy Gloss is a celebration of color. 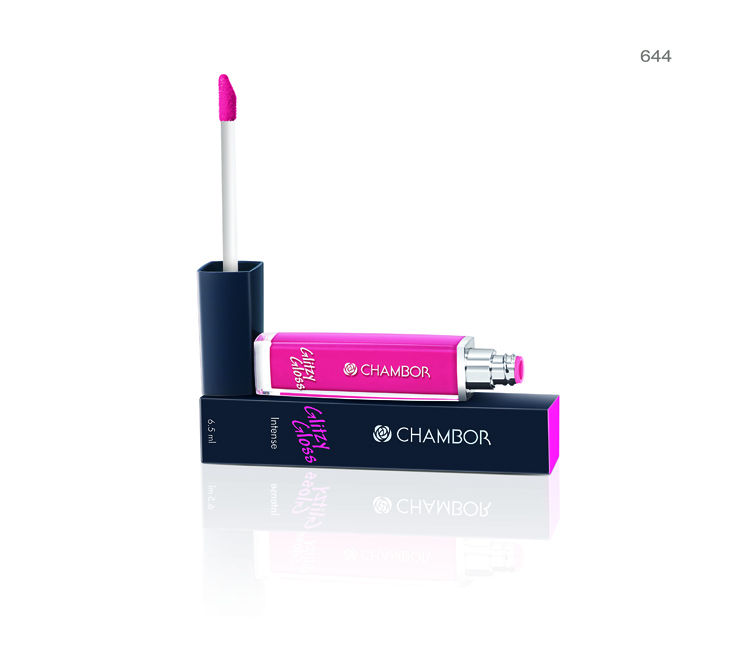 Available in 18 shades in hues of Pink, Brown and Red, Chambor Glitzy Gloss is available for Rs. 655/- at the newly opened Chambor Boutique at Phoenix Market City and all leading departmental stores.